great to see the progression that the platform has taken, i can remember using one of the first builds at college... only wish id kept the original site going. We've been using WordPress since 2009, and see how powerful it has become. May it continue to grow and improve. I've been using WordPress since 2.x versions, back in those days was using it primarily for blogs, but since the introduction of WordPress custom post types, now I am using it as a CMS! Awesome infographic! 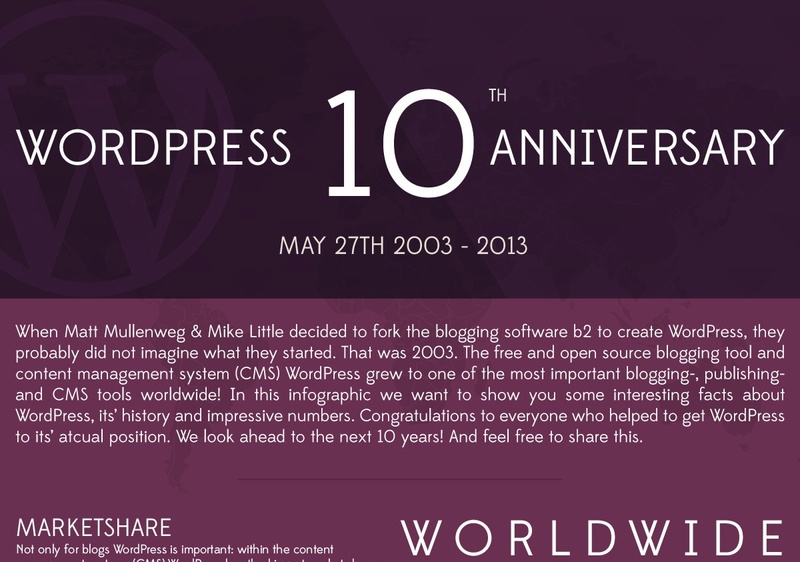 It's amazing to see how far WordPress has come! Thanks for the above, I would like to start a free WordPress blog on the WordPress site (not my own domain) but I don't like the themes they provide. Can I use a downloaded theme on there? I have seen some WordPress hosted blogs with different themes, so it looks like it's possible. Really amazing WordPress info graphics. I love to use WordPress. Great and Unique updates. Thanks for sharing.